Baltimore County House of Delegates members hold a standing-room-only town hall in Towson January 2. Sterner: John, this is partly about the money the county “forward funded” to help pay for new and renovated schools? Lee: The county says it’s owed $158 million from the state. This is money the county has already spent on school construction but wasn’t scheduled to get from the state until some years down the road. The county wants that money now instead of waiting for it. The reason for that, and you heard a lot about it during the 2018 campaign, is that the county spent beyond its means when it built and renovated dozens of new schools in recent years. And that job isn’t done. 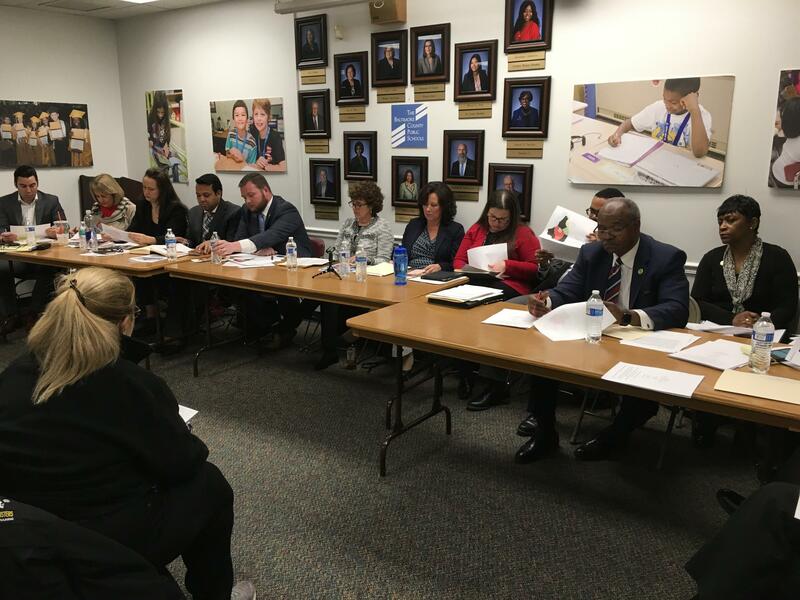 Last week, Baltimore County legislators held a town hall in Towson. And they heard from people like Phoebe Evans Letocha, who has children at Towson High. She told legislators it is an embarrassment that that county still has so many overcrowded schools. Letocha says Towson High has had trailers to deal with overcrowding there since 2004. Letocha: 15 years of trailers. Note that is longer than the current senior class has been enrolled in the BCPS system. Lee: I spoke with Baltimore County Democratic Delegate Shelly Hettleman, who is a member of the House Appropriations Committee. She says getting the forward-funded money will be tough but not impossible since Baltimore County Executive Johnny Olszewski is himself a former delegate and has contacts at the state capital. Hettleman says Baltimore County’s needs go beyond building schools, but also with what’s going on inside them. Hettleman: We have increases in numbers of struggling learners, increase in numbers of English language learners, so we have real needs in this county too, even though we’re better off than lots of other counties. Lee: Hettleman reminded me that the General Assembly cannot add money to the budget. She says Governor Hogan and County Executive Olszewski need to hash it out. Sterner: Is there any indication that that is happening? Lee: Perhaps. The governor and the county executive have spoken since Olszewski’s inauguration. Ellen Kobler, a spokeswoman for the county executive, says the two talked about the importance of modernizing the county schools. But let’s not forget that during the campaign Olszewski also talked about using his contacts at the state capital to get up to $1 billion from the state for school construction, so we shall see. The governor says he will add nearly $2 billion for school construction projects over the next five years but that is statewide. Sterner: You mentioned county legislators held a town hall. Were any other issues brought up besides education? Lee: Yes, and let me tell you this was a robust town hall. Sometimes you go to these things and you can hear the crickets chirping but in this case the room was packed to the gills. People spoke out on issues like climate change, solar farms, over-fishing, legalizing marijuana, help for people who are caring for sick and aging family members, and the high cost of prescription drugs. Ed Johnson with the Maryland Citizens Health Initiative asked the county’s house members to support legislation to establish a Prescription Drug Affordability Board, that would look at costs and set rates. And by the way Olszewski says he supports that proposal which is being sponsored in the senate by Baltimore County State Senator Kathy Klausmeier. Baltimore County’s next county executive, Democrat Johnny Olszewski, will take office in one month, which means he has to put together a transition team quickly, starting the morning after the election. “We’re going to have to assemble a plan to build a diverse team that reflects the strength of our county and welcome and solicit even more feedback about what people want to see for their neighborhoods,” he said Tuesday night.